The most striking feature of this piece is that it is in the form of a mandolin, an instrument derived from the lute, used primarily during the Renaissance and Baroque periods. Musical instruments have long been associated with the harmony of love, and this romantic allusion would have been a clear to the owner. 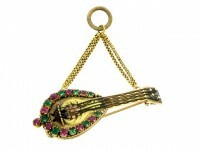 Other instruments such as the hurdy-gurdy, the viol and the lyre were also popular forms in love jewellery at this time. One commonality born by these instruments is that each was largely obsolete by the time these jewels were made, replaced in orchestras by more modern inventions, such as the guitar and the piano. Instead of from contemporary life, the inspiration for these antiquated instruments was taken directly from Gothic and Renaissance artworks, primarily ecclesiastical sculpture and altarpieces, due to a growing taste for what are now termed the Gothic and the Renaissance Revival styles. Designers working in this mode generally preferred to focus on romantic themes, such as beautiful muses and putti, or cherubs, playing instruments, such as in Rosso Fiorentino's (1494-1540) Musical Angel dating from 1522. Some of the most accomplished jewellers of the nineteenth century created works centred around these themes, the most notable of which was François-Désiré Froment-Meurice (1802-1855). An example of his work in the Renaissance Revival style, displaying a muse and putti playing period instruments, can be seen in Berganza's current collection (ref. 15477). Further to the form, the locket is a quintessential love jewel, continuing the amorous theme. The concealed compartment was created to contain a portrait of a loved one or a love token such as a lock of the lover's hair. Romantic symbolism also continues in the choice of materials used in this locket. Gemstones held distinct meanings at the time this piece was created; both the emeralds and rubies refer to variants of love, the former to constant love, rebirth and fecundity, and the latter to passionate love. The hues of these symbolic gems are echoed in the green and pink (or 'rose') gold used to decorate the body of the piece, as well as in the motifs, specifically the rose, another symbol of passionate love. In addition to the theme of love, this piece bears symbolism appropriate to Christmas. The coloursred and greenthe traditional colours of Christmas, are perhaps the most obvious correlation. Firmly established by the sixteenth century, red was adopted to represent the blood of Christ, a presage of Jesus' crucifixion, while green represents hope, rebirth and eternal life, a reference to his imminent resurrection. The rose, which appears on both the back and front of the locket, is often associated with Christian martyrs, as well as with the Virgin Mary. She is often represented with roses in Medieval and Renaissances paintings; one famous example is by Sandro Bottecelli (1445-1510), the Madonna del Roseto, painted circa 1470, of the Madonna and Child in a rose garden. One final connection to the holiday, period instruments such as these, due in part to the Gothic and Renaissance revivals of the nineteenth century, are often associated with cherubs, who are frequently depicted playing instruments around the Virgin and Child in Renaissance altarpieces, and ever since have been a part of the iconography of Christmas.